​The current patch was designed in 2007 as a collective effort by the Officers of the Police Department. The 'Coat of arms' design focuses on John Campbell who was one of the more prominent citizens that first settled in the area. He was one of the many settlers of Scotch-Irish decent. Campbell was given one of the largest tracts of land (352 acres) in the area, by William Penn, known as Londonderry Township (now currently North and South Londonderry Townships). Campbelltown was formed and became the largest and oldest community, as well as a "hub" town between Harrisburg, Lebanon and Cornwall. The 'Coat of arms' for the Clan Campbell of Argyll, Scotland was used in the design of the shoulder patch. Incorporated into the design was the Pennsylvania keystone as well as the bell from the H.M.S. Campbeltown, a historic ship used by the British Navy in World War II that was given to the British by the United States. Argyll, Scotland is also the town for which the H.M.S. Campbeltown was named, as well as its namesake in the U.S. (Campbelltown, Lebanon County, PA). The Latin words "Ne Obliviscaris" scrolled above the helmet were original to the Campbell coat of arms. Its meaning is "Forget not". The helmet signifies protection and security in defense; The two lions in red depict strength and courage; The two objects in black and yellow are called Gyronnys. They stand for Unity (and are also the main objects in the Campbell families from both Ireland and Scotland). The Latin words that surrounded the original Campbell family coat of arms were replaced with the words, "Servitum", meaning "Service" and "Fiat Justitia", meaning "Let Justice Prevail". Lastly, the date when South Londonderry Township was formed was incorporated into the patch design, inside a banner at the bottom under the shield "Est. 1894." The half moon shoulder patch was worn by the full time and auxiliary police in South Londonderry Township. It is believed that this patch had been used since the police department's formation in 1947 until the last of Auxiliary police had worked in 1976. In 1972, Chief Michael Hikes asked Fred Carpenter of Palmyra, to design a shoulder patch to be worn by the full time police officers. This shoulder patch was worn on the officers uniforms until April 2007, when the patch was updated. 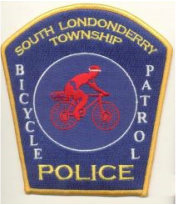 ﻿In June of 2012, Bicycle Patrol Officers began displaying the bicycle patch on the right shoulder of their bicycle patrol shirts. In December of 2014, PTL Ague began wearing the K-9 patch once Rex was put into service.